Zhiling Lan is a Professor at the Department of Computer Science, Illinois Institute of Technology. She is also a Guest Research Faculty at the Argonne National Laboratory. She received her Ph.D.(Computer Engineering) in 2002 from Northwestern University (Thesis Advisor: Valerie Taylor). Zhiling Lan is Associate Director of Scalable Computing Software Laboratory at the Illinois Tech. She currently leads the SPEAR (Systems for Performance, Energy, and Resiliency) Group . NEW! RA openings are available to hard-working and self-motivated undergraduate and Ph.D. students in my group. If interested, please send me a copy of you CV. Before sending me any email, please check my research projects/publications and make sure that you are really interested in my research. [ACM HPDC'19 Paper] AMrch 2019: Our paper "Scheduling Beyond CPUs for HPC" has been accepted by HPDC'19. Congrats to Yuping! [2018 DOE Extreme Heterogeneity Report] I participated in the DOE Extreme Heterogeneity Workshop, and the corresponding report is available online. [IPDPS'18 Paper] Dec 2017: Our paper "Trade-off Study of Localizing Communication and Balancing Network Traffic on Dragonfly System" has been accepted by IPDPS'18 (top 8% of the 461 submissions). Congrats to Xin! [Cluster'17 Paper] July 2017: Our paper "Trade-off Between Prediction Accuracy and Underestimation Rate in Job Runtime Estimates" has been accepted by Cluster'17 (21.8% acceptance rate, 47 out of 216). Congrats to Yuping! Memorable moments at Illinois Tech Commencement May 2017. [NSF Grant] July 2017: Dr. Lan's proposal on "IRON: Reducing Workload Interference on Massively Parallel Platforms" is recommended for funding at NSF! [Summer Internships] Three doctoral students (Xin, Yuping, Peixin) work as summer interns at Argonnal Nat'l Lab in the summer of 2017. [Ph.D. Defense] April 2017: Congratulations to Sean Wallace for successfully defending his PhD thesis! Sean joins Cray Inc.
[Ph.D. Defense] April 2017: Congratulations to Xu Yang for successfully defending his PhD thesis! Xu joins Amazon. [Ph.D. Defense] April 2017: Congratulations to Eduardo Berrocal for successfully defending his PhD thesis! Eduardo joins Intel. [JSSPP'17 Invited Paper] Feb 2017: Our joint paper with ALCF "Experience and Practice of Batch Scheduling on Leadership Supercomputers at Argonne" will be presented at JSSPP'17. Congrats to Yuping! [NSF Grant] July 2016: Dr. Lan's proposal on "Experimental-based Research on Effective Models of Parallel Application Time, Power, and Resilience" is recommended for funding at NSF! [Cluster'16 Paper] July 2016: Our paper "Exploring Plan-Based Scheduling for Large-Scale Computing Systems" has been accepted by Cluster'16 (24% acceptance rate, 39 out of 162). Congrats to Xingwu, Zhou, and Xu! [SC'16 Paper] June 2016: Our paper "Watch Out for the Bully! Job Interference Study on Dragonfly Network" has been accepted by SC'16 (18% acceptance rate, 82 out of 446). Congrats to Xu! [SC'16 Paper] June 2016: Our paper "A Data Driven Scheduling Approach for Power Management on HPC Systems" has been accepted by SC'16 (18% acceptance rate, 82 out of 446). Congrats to Sean and Xu! [EuroPar'16 Paper] May 2016: Our paper "Exploring Partial Replication to Improve Lightweight Silent Data Corruption Detection for HPC Applications" has been accepted by Euro-Par'16. Congrats to Eduardo! [Summer Internships] Three doctoral students (Xu, Xin, Yuping) work as summer interns at Argonnal Nat'l Lab, Eduard works as a summer intern at BellLab, and Sean teaches CS450 "Operating Systems" at the Dept. of Computer Science in the summer of 2016. [Research Seminar] Zhiling Lan gave a research seminar entitled "Toward Smart Supercomputing via Active Learning and Intelligent Scheduling" at Hunan University in April, 2016. [Research Seminar] Zhiling Lan gave an Applied & Computational Mathematics seminar entitled "Overview of Parallel Machines and Programming Models" at the National University of Singapore in March, 2016. [Ph.D. Defense] Congratulations to Li Yu for successfully defending his PhD thesis! Li will join Google Inc. in Spring'16. [Ph.D. Defense] Congratulations to Zhou Zhou for successfully defending his PhD thesis! Zhou will join Salesforce in Sprng'16. [Cluster'15 Paper] Sept. 2015: Our paper "I/O-Aware Batch Scheduling for Petascale Computing Systems" has been presented at Cluster'15 (24% acceptance rate). Congrats to Zhou and Xu! [TPDS Paper ] August 2015: Our paper "A Scalable, Non-Parametric Anomaly Detection Method for Large Scale Computing" has been accepted by IEEE Trans. on Parallel and Distributed Systems (TPDS). Congrats to Li! [HPDC'15 Paper] June 2015: Our paper "Lightweight Silient Data Correpution Detection Based on Runtime Data Analysis for HPC Applications" (short paper) has been presented at HPDC'15. Congrats to Eduardo! [JPDC Paper ] May 2015: Our paper "Quantitative Modeling of Power Performance Tradeoffs on Extreme Scale Systems" has been accepted by Journal of Parallel and Distributed Computing (JPDC). Congrats to Li and Sean! [Summer Internships] Five doctoral students (Zhou, Xu, Xin, Eduardo, Xingwu) work as summer interns at Argonnal Nat'l Lab in the summer of 2015. [IPDPS'15 Paper] Dec. 2014: Our paper on "Improving Batch Scheduling on Blue Gene/Q by Relaxing 5D Torus Network Allocation Constraints" has been accepted by IPDPS'15 (21.8% acceptance rate). Congrats to Zhou and Xu! [Cluster'14 Best Paper Award] Sept. 2014: Our paper "Exploring Void Search for Fault Detection on Extreme Scale Systems" received the Best Paper Award at IEEE Cluster'14. Only one out of 29 accepted papers was selected for the award. The conference has an acceptance rate of 23.8% for regular full papers. Congratulations to Eduardo, Li, and Sean! [NSF Grant] July 2014: Dr. Lan's proposal on SPEaR (Scheduling for Performance, Energy, and, Resilience efficiency) is recommended for funding at NSF! [SC'14 Paper] June 2014: Li's collaborative paper with Oak Ridge National Lab on resilience modeling is accepted by IEEE/ACM SC'14. It is nominated for Best Student Paper Award. Congrats to Li! [Student Internship] Doctoral student Li works as an intern at Oak Ridge Nat'l Lab between Jan. - Aug. of 2014. [Summer Internships] Two doctoral students (Zhou and Sean) work as summer interns at Argonnal Nat'l Lab, Xu works as a summber intern at Fermi Nat'l Lab in the summer of 2014. [NSF Grant] July 2013: Dr. Lan's work on topology awareness for large-scale systems is recommended for funding at NSF! [Summer Internship] Doctoral student Zhou works as a summer intern at Argonnal Nat'l Lab in the summer of 2013. [Student Research Fellowship ] Ph.D. student Sean Wallace has been awarded the IIT Starr and Fieldhouse Research Fellowship for the year of 2013. Congratulations to Sean! [Research Grant] July 2013: Dr. Lan's work on HPC analytics for extreme scale computing is funded by DOE/Argonne National Lab! [Conference Papers] July 2013: Our work on energy aware scheduling, power profiling, and non-parametric anomaly detection are accepted by SC'13, Cluster'13, and CAC'13, respectively. Congrats to Xu, Zhou, Sean, and Li! [Ph.D. Defense] Congratulations to Jingjin for sucessfully defending her Ph.D. thesis on July 10, 2013! [Invited Talk] Dr. Lan will give a seminar talk at the IEEE Reliability Society Meeting on Sept. 13, 2012. [Ph.D. Defense] Congratulations to Wei for successfully defending his PhD thesis in July 2012! [Ph.D. Defense] Congratulations to Ziming for successfully defending his PhD thesis in July 2012! [SC'12 Paper] Our paper "Hierarchical Task Mapping of Cell-based AMR Cosmology Simulations" is accepted by SC'12. Congratulations to Jingjin! [ICAC'12 Paper] Our paper "3-Dimensional Root Cause Diagnosis via Co-Analysis" is accepted by ICAC'12. Congratulations to Ziming and Li! [DSN'12 Paper] Our paper "Filtering Log Data: Finding the Needles in the Haystack" is accepted by DSN'12. Congratulations to Li and Ziming! [Inivted Talk] Dr. Lan is invited to give a seminar talk "System Monitoring, Diagnosing, and Predicting for Extreme Scale Computing" at Argonne Leadership Computing Facility in April, 2012. [IPDPS'12 Paper] Our paper on improving parallel I/O for ART is accepted by IPDPS'12. Congratulations to Yongen and Jingjin! 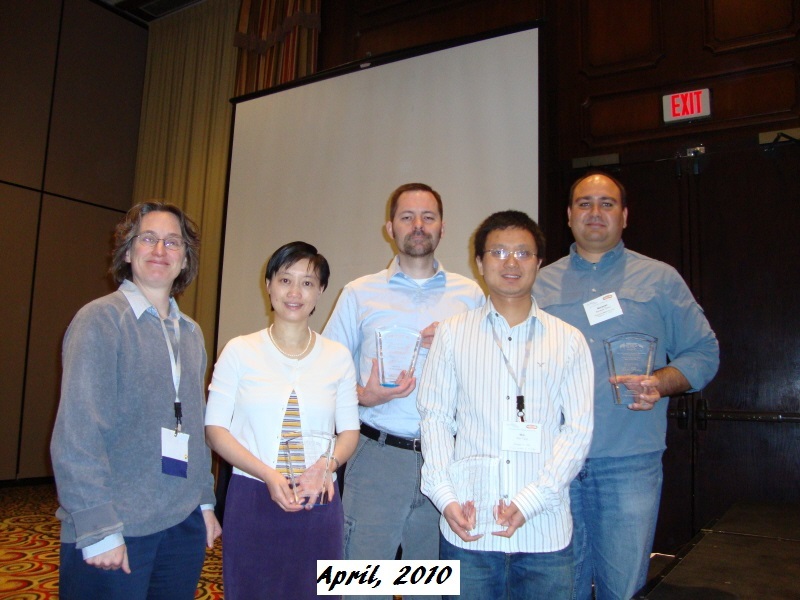 [Contest Award] Ph.D. student Ziming Zheng has recently won "The Cray Log Analysis Contest" at the First USENIX Workshop on the Analysis of System Logs (WASL'08), which was co-located with the 8th USENIX Symposium on Operating Systems Design and Implementation (OSDI'08), December 8-10, 2008. Congratulations to Ziming! [Student Research Fellowship] Ph.D. student Wei Tang has been awarded the IIT Starr Fellowship for the year of 2009. Congratulations to Wei!